CEO Brooks Resigns From News International; Indonesia Volcano Erupts : The Two-Way News International CEO Rebekah Brooks resigns; a heat wave is building across the central and eastern U.S.; a volcano is erupting in Indonesia; and in Boston, a large jet clips the tail of a smaller jet as both prepare to depart Logan Airport. Embattled News International chief executive Rebekah Brooks has resigned, the latest senior news official from Rupert Murdoch's News Corp. to quit in the wake of the phone hacking scandal that's roiled Britain. Reuters says Tom Mockridge, head of News Corp.'s Italian arm, will replace Brooks. With hot weather in much of the country, the National Weather service is warning conditions are ripe for a "massive heat wave" to develop into next week, with heat values jumping past 110 degrees in the central and eastern parts of the country. Indonesia's erupting Mt. 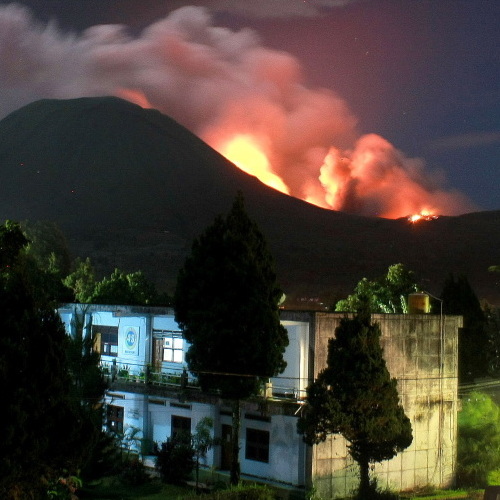 Lokon volcano has forced more than 4,000 people to flee, according to CNN. There've been two major eruptions since Thursday night. Al Jazeera reports lava flowed down the volcano's slopes, setting trees on fire. It last erupted in 1991. Last night in Boston, a Delta jet headed for Amsterdam clipped the tail of a smaller, smaller plane as both were getting ready to pull out of Logan Airport. The AP says the smaller jet belongs to Atlantic Southeast Airlines, a Delta regional carrier, bound for North Carolina. One minor injury was reported.